Green tea can have such a mild flavor on its own that is easy to layer other flavors on top of it. 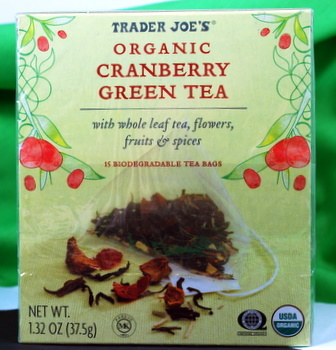 This is probably why it is used as the base in Trader Joe’s Organic Cranberry Green Tea, as the added flavors – all natural ingredients – are. The tea is flavored with hibiscus flowers, cardamom, lemongrass, cinnamon, apple, star anise, rosehips, clove and cranberries. It takes on a pinkish hue when brewed and has a very floral scent, almost perfumy. The fruity flavors aren’t strong, but they do add a nice hint of sweetness to balance the floral notes. One really nice feature of this tea, in addition to the fact that it is organic, is that the pyramidal tea bags are biodegradable. Unfortunately, the bags are also individually packaged in plastic wrappers and the box is very oversized for the number of bags included. Still, the tea is very good, but the over-packaging takes some of the glow away from the the eco-friendly elements of the product.